Physical Design Training – Enroll Now to Grab Best Price. Physical Design Training is a 14 weeks course(+5 weeks for freshers covering Device basics, Digital Design concepts, TCL, and UNIX OS) structured to enable aspiring engineers get in-depth knowledge of all aspects of Physical design flow from Netlist to GDSII including Floor planning, Placement, power planning, scan chain reordering, global routing, clock tree synthesis, power analysis and ECO. Course also involves multiple hands on projects using Synopsys Implementation flow. It is among widely used PnR flow in industry. Synopsys ICC & Primetime are industry standard sign off tools for Physical design & STA(sign off: chip STA is closed only when project flow is run on these tools), given this; would you learn Synopsys tools or any other tools for Physical Design training? Physical Design training program is well illustrated and supported with real-time examples from the industry. 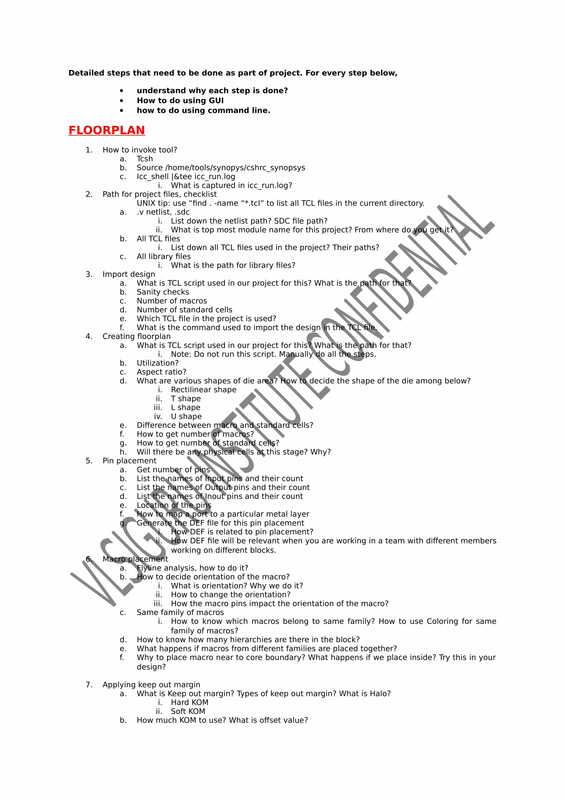 Floorplanning, Placement and Routing, Clock Tree Synthesis, Final Routing and Timing Closure forms the core of the Physical Design Training program structure. Thorough and micro level wide understanding of the concepts across all the Physical Design flow would be the key highlight of this program. Complete Theory Sessions and complementing Lab Sessions with projects (at least two) on Million Gate Design from Netlist to GDSII, guided well by expert trainer are offered for every candidate of this Physical Design Training program. Physical Design Training is supported using 15+ assignments covering all aspects of physical design implementation concepts including practical aspects. These assignments cover 90% of questions asked in interviews. These will solved as part of course lectures. Student will have 6 months access to tool from date of course registration. Student has option to connect to servers from home using VPN. VLSIGuru Institute is setup in 2012, helped 1000+ students find right opportunities. VLSIGuru offers most affordable Physical Design Training in Bangalore. Bachelors and Masters of Engineering Students fresh out of graduation and ASIC Design Engineers who are in other areas of Implementation spectrum such as Front-End Logic Synthesis or Front-End STA can take this Physical Design course to make themselves completely equipped and industry ready. Online Physical Design Training is offered for students based out of Bangalore. Physical Design Training is a 14 weeks course (+5 weeks for freshers covering Device fundamentals, Timing concepts. advanced digital design, TCL, and UNIX OS) structured to enable aspiring engineers get in-depth knowledge of all aspects of Physical design flow from Netlist to GDSII including Floor planning, Placement, power planning, scan chain reordering, global routing, clock tree synthesis, power analysis and ECO. Course also involves multiple hands on projects using Synopsys Implementation flow. It is among widely used PnR flow in industry. Physical Design Training is supported using 15+ assignments covering all aspects physical design implementation concepts as well as practical aspects. These assignments would cover more than 90% of questions asked in interviews. These assignments will solved as part of course lectures. Student will have 6 months access to tool from date of course registration. Student has option to connect to servers from home using VPN. VLSIGuru Institute is setup in 2012, helped 500+ students find right opportunities. 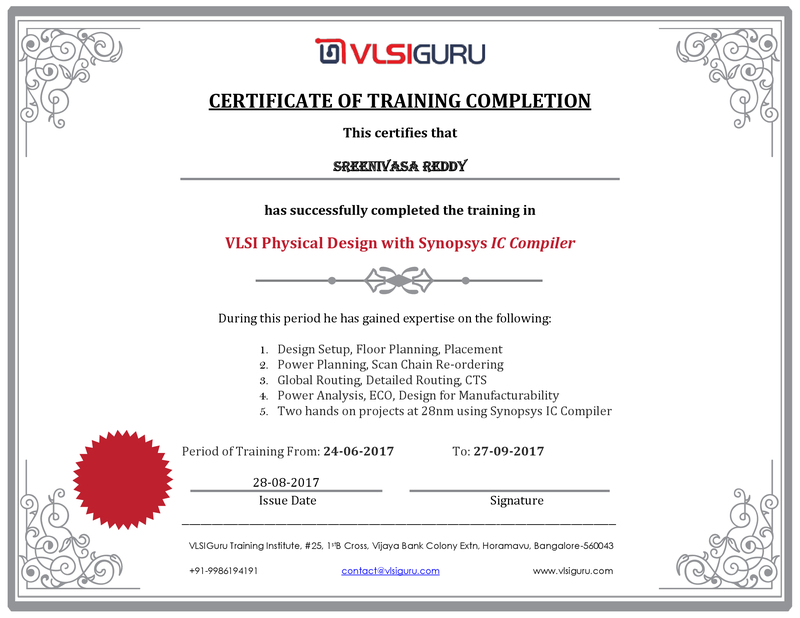 VLSIGuru offers most affordable Physical Design Training in Bangalore. Bachelors and Masters of Engineering Students fresh out of graduation and ASIC Design Engineers who are in other areas of Implementation spectrum such as Front-End Logic Synthesis or Front-End STA can take this Physical Design course to make themselves completely equipped and industry ready. Online Physical Design Training is offered for students based out of Bangalore. Below are the Physical design Training topics. Defining Clock Buffers and Inverters. Set Clock Tree Timing DRCs. Saturday & Sunday(8:30AM – 4:30PM India time. Monday to Friday(9:30AM to 12:30PM). Weekdays sessions will be focused on training on device fundamentals – Digital Design – UNIX and TCL scripting. Evaluation tests 50(student will take one evaluation test once every 2 days; followed by discussion on same). Why course fee very less compared to other institutes? Most of the times, reasoning for any institute to charge higher fee(excess of 1 lakh) is tool cost is high. It is not true. VLSIGuru believes in creating educational model which is affordable and, sustainable in the long run. It has been a success since we started training in 2012. Since then we have trained 2400+ students in VLSI alone. We estimate to train 1200 students in 2018. Institute owns the office facility, hence we avoid rental expense. Keeping it aside, we also find it difficult to comprehend why course fee should be in excess of 1 Lakh. Labs Copy labs from /home/vlsiguru/PHYSICAL_DESIGN/TRAINER* Refer to README files in individual folders. acroread File_name.pdf to open any document.